2012 has already started with a bang! Fishing has been great, the weather has been mild for the most part and the fish have been hitting our flies hard! Currently the weather is still allowing us to get our boats out in hot pursuit of cutthroat trout on the fly, and man has it been a riot! We have also had the luck of bi-catching a few rainbows and bull trout so far. We have been focusing most of our efforts on the Harrison and Fraser River systems. If you want to get out and enjoy an action-packed day of cutthroat trout fishing, learn some tips and tricks from our pro fly fishing guides, now until April is the time to go! We are offering full day fishing trips starting at $125 per person per day. Please email us for more details. We are looking forward to a tremendous spring of sturgeon fishing. We are now taking bookings for our April Fraser River sturgeon fishery! Sturgeon fishing in April is one of my favorite times to fish, and it is very popular among our guests. The sturgeon are waking up from their winters rest and are eating anything available! 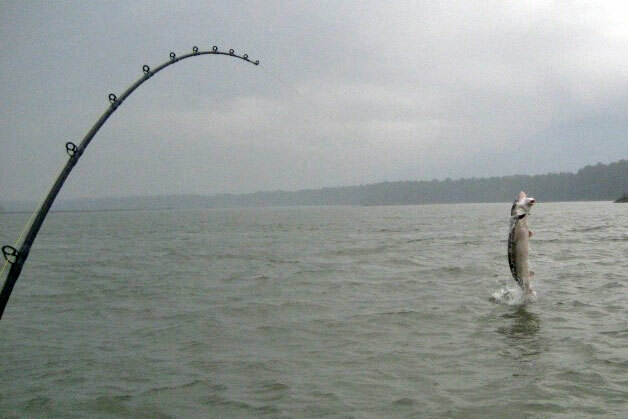 The bites are steady, and the baits are hit hard so hold on tight! We have our spring sturgeon discounts on right now. We are on Facebook! There will be up-to-date news, reports, photos, contests and much more! To follow us on facebook please click here.